Our Sun is mostly composed of hydrogen and helium gasses ionized by the nuclear energy at the center. While it is the center of our solar system, it is far from being a static body. First, it is moving with the other suns within the Milky Way and secondly it has internal dynamics due to rotation and internal heat and magnetic forces. The image below is what is typically seen by the naked eye with a telescope through a solar filter. The outer region consists of the chromosphere and the photosphere with the outer chromosphere being very thin. The photosphere is what is viewed and it has an active granular texture. Specific details of the Sun are given in the Appendix. The sun is obviously very large, radius of 6.9599×10^5 km and mass of 1.989×10^30 kg. However, it is not the largest sun (star) in the solar system. Others are many time the size of our sun. Note the sunspots to the right along the equator. Sunspots are a result of the action of internal magnetic forces generated by the differential rotation or a dynamo effect of the internal layers. They emergence through the photosphere results in the turbulence around a sunspot. The sunspots themselves occur in pairs since they are the two poles (N-S) of a magnetic fieldand are similar in appearance to a horseshoe magnet. They will vary in strength from weak to very strong, the latter observed as auroras in the polar regions of Earth. Depending on the activity, there may be none or many sunspots and these are known to affect the weather and radio communication on Earth. The Sun’s rotation about its axis can be followed by observing the movement of the sunspots. 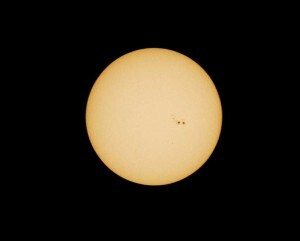 The video above is of the sunspots shown in the photo. Note that there are four sunspots and they appear to behave as pairs. A more dramatic presentation of sunspots and the emitted flares is shown in the link below. Note the horseshoe magnet appearance. Observing Jupiter and its satellites is a good introduction into the physical forces controlling motion in the universe. The figure below shows Jupiter on 2 June 2006 with the moons Europa, Io and Ganymede circling. Callisto is also circling but is not shown. Details of Jupiter and the moons are given in the appendix. With his new telescope, Galileo noted that the moons of Jupiter were circling the planet itself, which was orbiting the Sun. It was this observation that caused Galileo to comment that there was a center in the universe in addition to the Sun, contrary to belief at that time. From the appendix we see that Io and Europa have smaller mass and are orbiting closer to Jupiter than are Ganymede and Callisto. The observation of small masses (the moons) orbiting around large bodies (Jupiter) was a significant contributor to the development of Newton’s famous laws of motion, as shown below. Where the large mass (m1) represents the planet (Jupiter) the smaller mass (m2) is a moon. Newton said that the attraction force (Fa) between the two was directly governed by the product of their masses the gravitational constant G and inversely related to the square of their separation distance (R), as shown by the equations for force (F). Newton’s law of gravitation. (2007). This is the force acting inward on the smaller moon as a result of being in the presence of the larger mass, Jupiter, and is the relationship which applies when dropping a rock or a baseball, they fall directly to the Earth. So, why do the smaller moons not fall directly to Jupiter? The answer is the centrifugal force of motion as shown below. Here the smaller moon (m) is shown to be rotating about the center of the Jupiter planet system and the centrifugal force is acting outward, countering the gravitational attraction (tension, or centripetal force) toward the planet. This is analogous to spinning a ball at the end of a string around our heads. 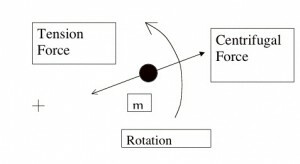 The magnitude of this outward directed centrifugal force (Fout) is given in the equation to be directly related to the mass (m), the radius of rotation (R) and the rotation speed (omega) squared. While equilibrium could exist with this simple system, the fact is that the full Jupiter planet system is more complex, consisting of all of the previously mentioned moons in addition to Jupiter. Each mass has a gravitational attraction to each of the other masses and each mass has an independent centrifugal force. They exist in quasi equilibrium, i.e. very vulnerable to disruption from outside forces. Outside forces are quite common such as gravity waves from other planet systems and impacts from asteroids and other stray space mass.